CREPY. - [Title page] Atlas Nouveau portatif à l'Usage des Militaires College et du Voyageur. Tome Ier . . .
[Title page] Atlas Nouveau portatif à l'Usage des Militaires College et du Voyageur. Tome Ier . . . - CREPY. 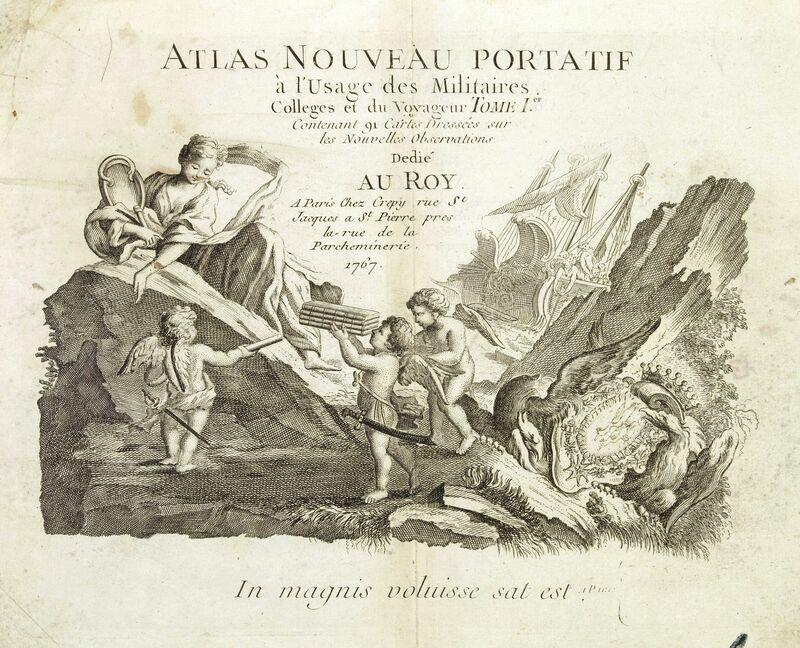 Title : [Title page] Atlas Nouveau portatif à l'Usage des Militaires College et du Voyageur. Tome Ier . . .. Size : 8.3 x 10.8 inches. / 21.0 x 27.5 cm. Description : A decorative title page, showing winged puttee presenting four volumes to a reclining female figure on a rock. Other decoration includes a sailing vessel with somebody using a line to take soundings and a winged griffin type animal holding an armorial. The title page was very popular in the 18th century and was first used by le Rouge(1743), there is a second state of the plate published by Desnos (1767) and later for an atlas with the same title. Here the text "TOME Ier" and Crepy's address are added. Condition : Paper slightly age-toned and spotted.